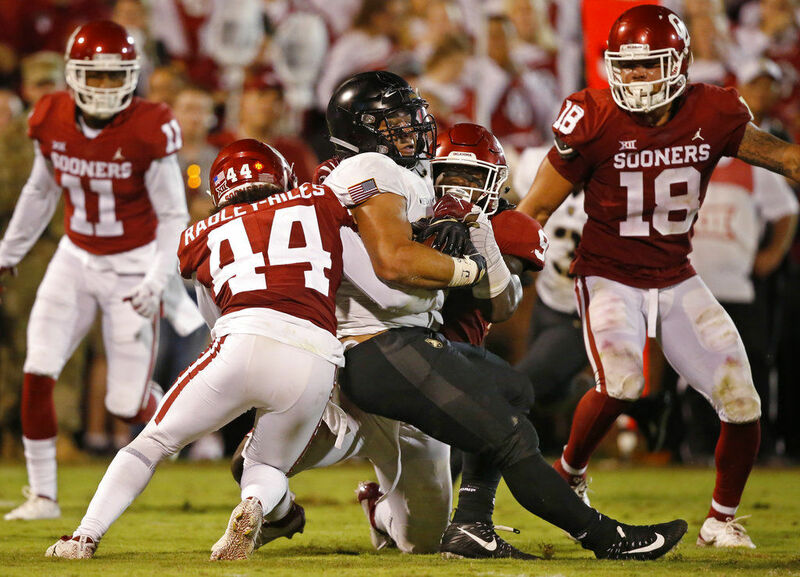 Since the top 25 will be almost purely mathematical from now on (I do have three paragraphs about the changes I made to the top 7), I plan to talk more about what happened on the field Saturday than why I like one team better than another. I wrote extensively about the 2003 game, LSU’s previous home win over Georgia, in my update to the LSU-Georgia Series Blog (since updated to add the result), so it was interesting to see the Advocate’s Scott Rabalais bring that game up here. That was one of the top games in the rivalry in my opinion because at that time they were the last two SEC champions facing off, and it was the first time either team faced opposing head coaches Nick Saban and Mark Richt, respectively. Also, LSU was one of only two teams to beat the Bulldogs that year (which they did twice). Both teams lost to Florida, who somehow lost 5 games on the season; but LSU would win the BCS national championship in the following January. It’s funny how the start of games can be so different from the way they play out. I almost feel bad for Georgia fans, because I would have been really frustrated. I don’t have to think back very far to recall such a feeling. After LSU took a 3-0 lead, Georgia took the field and was able to run on LSU almost at will after Florida ran for over 200 yards against the Tigers the week before. I thought it was going to be a long day. Then one running play didn’t work out for the Bulldogs setting up a 2nd and 9, and they largely gave up on the run. Two incompletions followed, and then on 4th and 9 they ran a fake kick. They gave up on Holyfield and Swift and flipped the ball to Rodrigo Blankenship? That was one of the dumbest set of downs I’ve seen from a major program this year. The Bulldogs didn’t run the ball the next possession either, a three and out. By this time LSU led 13-0. In the next 3 runs the Bulldogs averaged 4.3 yards, but I guess the scoreboard kept them from committing to the run in any kind of consistent way. Georgia ran for 71 yards in the drive that set up the fake field goal (before the lost yardage on the fake) and ended up with only 113 rushing yards for the game, but to be fair a few good runs were canceled out by negative plays. In LSU’s game at Florida, the Tigers were doing great on both sides of the ball early on. The Tigers had one touchdown drive to start up 7-0. The Gators got one first down on their next drive but stalled immediately afterward. Then LSU took only 5 plays to get down to the Florida 28, and Burrow fumbled it on first down. The Tigers didn’t establish that kind of rhythm again the rest of the game. Even in the only other touchdown drive, it was only four plays and 78 of the 80 yards came on two runs by Nick Brossette, so that’s not really what I’d call a rhythm. Here is the Mississippi St. rivalry blog if you want to look ahead to that game. It’s not talked about as much as some other series, but LSU has actually played more games against Mississippi St. than any other opponent. Something else I just noticed is LSU’s next three opponents will all be coming off of bye weeks. 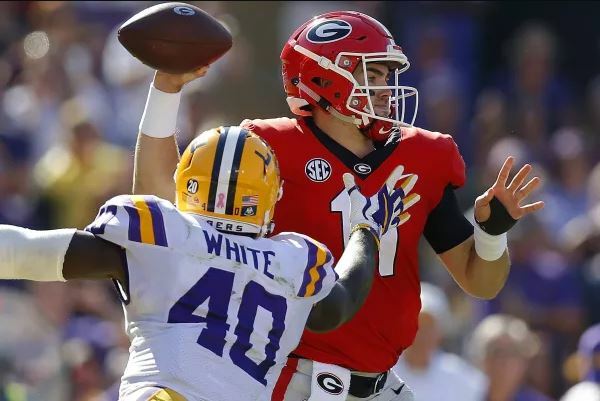 Georgia QB Jake Fromm (being pressured by LSU LB Devin White) completed only 47% of his passes, significantly reduced from his previous season average of 73%. Another thing that had made me a little nervous at the early going of the Georgia game was the way Auburn and Florida had looked against Tennessee and Vanderbilt, respectively. Auburn lost, but Vanderbilt had led Florida 21-3 before losing 37-27. I guess we’re just at the time of the season that you can’t really take anything from one week to the next as teams get into the heart of their conference schedules. No conference punishes you the way the SEC does if you don’t get up for a given game, but we still saw teams like West Virginia and U. Miami lose road games that on paper they should have won. I mentioned Auburn and U. Miami, who both lost, but there was another prior LSU opponent who almost lost as well. That was Ole Miss, who really seemed down and out. The Rebels missed a field goal with 13:47 left in the game while down 9. Arkansas did a good job running the clock and setting up disadvantageous field positions for the Rebels, but the Razorbacks didn’t score again. Ole Miss took advantage with 84- and 97-yard touchdown drives in the final 7 minutes. Arkansas will attempt to end its 6-game losing streak next week against Tulsa before facing Vanderbilt, another victim of a significant comeback. The Razorbacks will have a bye week before hosting LSU on November 9. Other than the WVU-Iowa St. and U. Miami-Virginia games I referred to earlier, I can’t tell you too much about the non-SEC games. Notre Dame didn’t look very impressive in the quarter or so I watched against Pitt; but as usual the Irish were just good enough to beat a lesser opponent. I only watched Washington-Oregon briefly. I can’t stand watching defenses who can’t tackle. I was going to turn on Michigan-Wisconsin after the SEC games, but it was already a blowout. I don’t understand how that game was chosen over LSU. The best team Michigan beat was Maryland, the only team Wisconsin beat that wasn’t terrible was Iowa, and both teams had losses (Wisconsin’s was to BYU). At least Lee Corso looks dumb, not that it was the first time. I’m keeping Alabama #1 for this week, but there is a good chance I will replace the Tide next week if Clemson wins (against N.C. St.) and becomes the computer #1 over idle Notre Dame. It’s not that Bama isn’t playing well; but they haven’t played any of the top 9 teams (in my opinion including non-conference games) in the SEC, and their only game in the next two weeks is against Tennessee. The Vols just beat Auburn; but being that it was their first SEC win since 2016, they’re not one of the top 9 teams in the SEC either. The Tide also don’t have a non-conference win that does them much good: Bama’s three opponents are only a combined 5-11 in FBS play, and two of them play in the Sun Belt. The only other change from the computer was to move Ohio St. up two spots to be ahead of Texas and Florida. Texas did lose to a Big Ten team after all. I didn’t want to move the Buckeyes higher since they really haven’t played anyone… anyone who didn’t just lose to Michigan St. anyway. Ohio St. belonged ahead of LSU going into the week even though my computer didn’t have them ahead, but with the win (and Penn St.’s loss) LSU is now 3-1 against teams in my top 40 when Ohio St. hasn’t played any of those teams. LSU has beaten 5 teams in the top 65 to Ohio St.’s 2; so however you look at it, I think LSU’s quality wins overcome the one loss at this point. It helps Ohio St. a little bit that the Buckeyes haven’t played an FCS opponent, but still for Ohio St. to be 96th in FBS strength of schedule and for LSU to be 3rd explains how LSU can afford a loss. Florida did beat LSU and has a better loss than Texas, which is why they’re ahead of the Longhorns; but I didn’t think the Gators had the quality wins to overcome the loss to Kentucky. LSU and Mississippi St. are the only top-50 wins according to my computer rankings. One of those two will lose value next week since they play one another, and Florida will lose value since they have the week off. It just makes sense to keep Ohio St. ahead for now when most likely Florida will fall next week anyway. Texas is off next week as well. So LSU had a touchdown stolen AGAIN and this time Notre Dame cheated on the play where they got the winning points as well, so that’s just groovy. We’ve beaten them four in a row if you go by the points we actually scored rather than the score the referees decided upon. I’m trying not to think about it though. So I’ll turn to something else I just love talking about, which is Nick Saban. You may know I’m not a huge fan of his, but ESPN has been repeating this stat about the Tide being 0-3 in Sugar Bowls under Saban. While technically true, it’s not really a fair description. The Tide is actually 1-1 when playing for a national championship in some way in New Orleans. The losses to Utah and Oklahoma were consolation Sugar Bowls after the Tide failed to win the SEC (after a conference-championship loss to Florida and the kick-six loss to Auburn respectively). The win over LSU in the BCS championship in 2011-2012 did not technically count as a Sugar Bowl. Auburn fans are likely to point out that those Tigers have beaten the Tide twice for the SEC West championship since 2013 (both on the Plains), but they tend not to mention the Tide clinched the SEC West in the Iron Bowl in 2012, 2014, and 2015. The Iron Bowl is a different type of game from a conference championship, a BCS Championship, or College Football Playoff though. While the winner almost always wins the SEC West in the last 10 years (LSU in the 2011 season was the only exception), it’s not a neutral-site game; and as we saw this year, it’s not necessarily even an elimination game. Except for Oklahoma in 2003 (when the human element counted for less than half of the standings), a loser of a conference championship game has never played for a national title though, so I think that does count as an elimination game. The games I will discuss are also played at neutral sites. 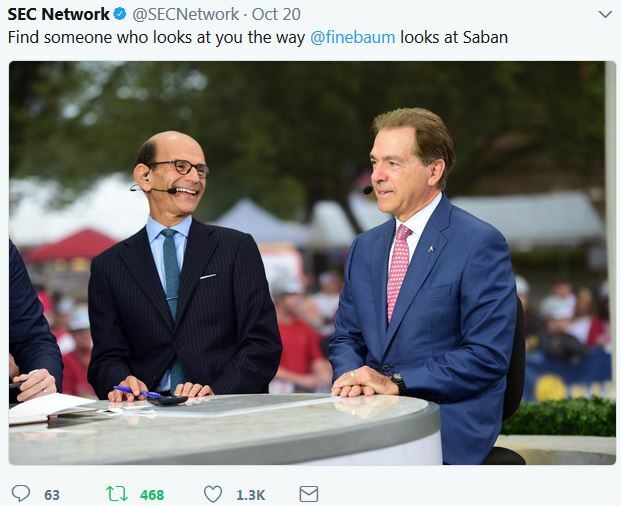 Since 2001, going back to LSU obviously, Saban is 14-3 when playing for a championship, which counts conference championships and national championships, including the three CFP semifinals in which the Tide has appeared. Saban is 2-1 in such games in New Orleans counting the BCS Championship with LSU in 2003. That game actually was called the Sugar Bowl. 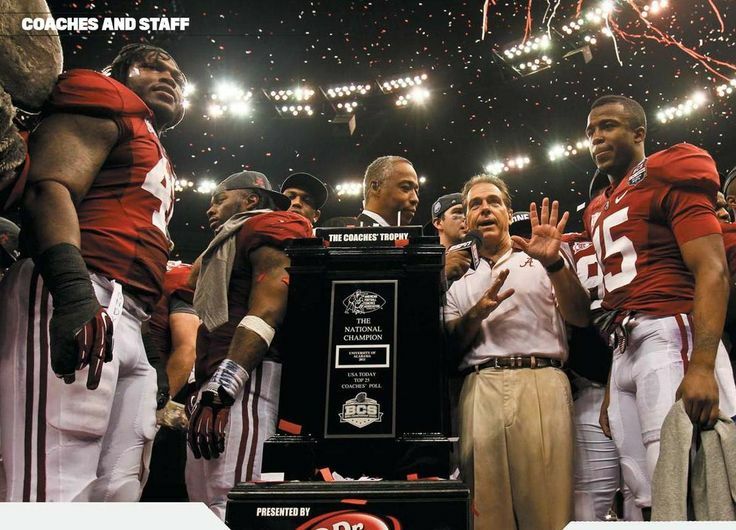 Under the lights of the Superdome, Nick Saban discusses the win over LSU in January 2012. It’s also of note that Saban has never lost two such games either in a row or in consecutive seasons. Other than Georgia’s win over Auburn a few weeks ago, the coaches of Oklahoma and Georgia do not have head coaching experience in such games. Dabo Swinney entered this year at 6-2, but six of those games were over the past two seasons, so there was no need for an extensive trip down memory lane there. The Tigers lost the ACC championship to Georgia Tech in 2009 (Swinney’s first season) and beat the Yellowjackets in a rematch to win the ACC in 2011. This is usually the week where I go completely hands-off with my rankings list including #1 here. Since it’s close and Georgia and Alabama are #1 and #2 in my formula and by consensus, I’m going to give Alabama one more week at #1. It has nothing to do with the SEC West vs. the SEC East; and it certainly has nothing to do with South Carolina, whom I consider underrated. 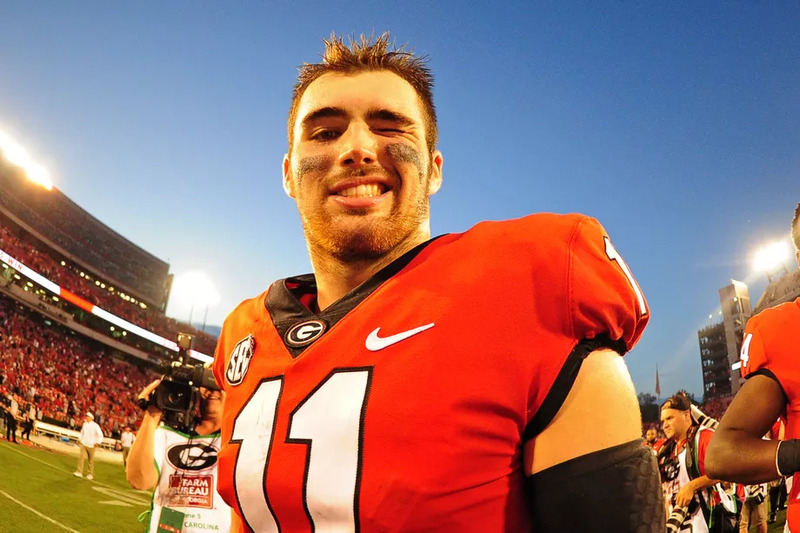 Georgia’s freshman quarterback Jake Fromm after the Bulldogs clinched their third SEC East title in 10 seasons. I just want to see more from Georgia before giving them that designation. I want to see how they respond to playing a second tough opponent in a row (I don’t think the way Florida played against them qualified), and I want to see how they respond to their second road game against a ranked opponent (the first since a one-point win over Notre Dame in Week 2). For more about LSU-Alabama, see here. I can hear the gripes already about Wisconsin, but Central Florida’s wins over Memphis and SMU are better than most of the Badgers’ wins right now. The best teams of the AAC are better than the Big Ten West minus Wisconsin (you don’t get any credit for scrimmaging yourself) and Iowa. I didn’t specify AAC East because unlike Wisconsin, Central Florida has played three of the four best teams from the other division in their conference. Wisconsin has played NONE of the top five teams in the Big Ten East standings. The two teams have played comparable non-conference games as well. Wisconsin will of course play Iowa, not to mention Michigan, one of the competitors in the Big Ten East; but you don’t get credit for future games. The Badgers also play Minnesota, a potentially bowl-eligible team in their division. Central Florida has two middling divisional opponents (Connecticut and Temple) before the finale against South Florida, which is expected to decide the AAC East. Also, I would anticipate that Wisconsin would gain more points in championship week, probably a lot more. The winner of Notre Dame and U. Miami will probably be a big player after this week as well. I don’t normally look at how far teams go up and down in terms of spots since it’s really about points; but if you notice more movement, there were 12 losses and a bye week between numbers 17 and 37, so this allowed some teams go up significantly. Auburn gained 12 spots, for instance. If they beat Georgia and Alabama and win the SEC Championship, they can make a few more leaps. I don’t think they will, but the opportunities are there. 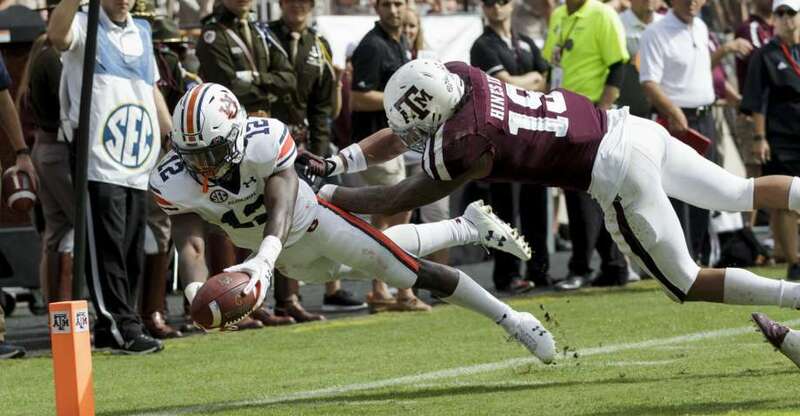 Auburn Wide Receiver Eli Stove stretches for a touchdown in College Station on Saturday. In related moves, Michigan went 6 spots by beating Minnesota, Iowa went up 8 spots by beating Ohio St., and Toledo went up 8 spots by beating Northern Illinois. LSU only fell 3 spots after losing to Alabama, and that’s despite that Florida win dropping in value every week. I still think LSU should have been ranked ahead of Auburn going into the week; but for now, Auburn goes ahead obviously. The only other teams to pass up LSU were Boston College, Toledo, and Northwestern. LSU passed up Arizona by having the “better loss”. 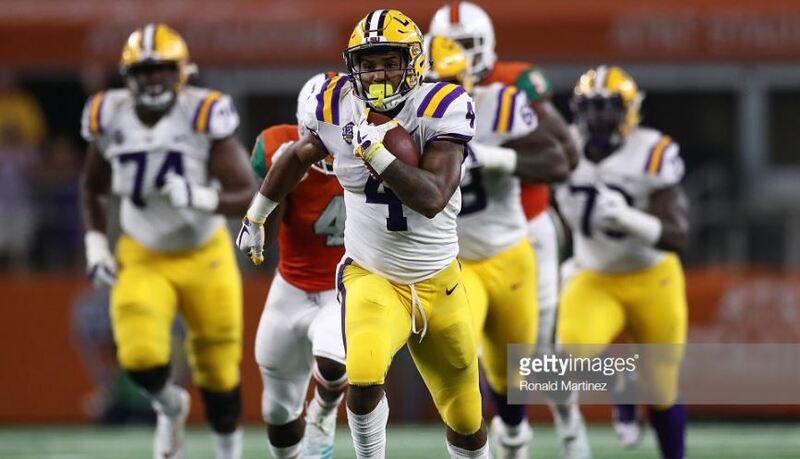 LSU doesn’t have huge potential for points in any one game left on the schedule; but with wins, the Tigers can gain moderate credit each week and make it back into the top 25 that way. Unlike most other SEC teams, LSU does not have a non-conference opponent left on the schedule. Mississippi St. doesn’t seem like they should be ahead of Auburn, but losses to Georgia and Auburn are better than losses to Clemson and LSU right now. Also, the Bulldogs’ wins over Louisiana Tech and Kentucky count for more than Auburn’s wins over Georgia Southern and Missouri. The gap between the two is only 0.015, which for reference is about 1/2 of the gap between Alabama and Georgia. Next week will be interesting as Auburn plays Georgia and Alabama plays Mississippi St. I don’t see anything else that really needs explanation, but I’m always interested in any objections in the comments. 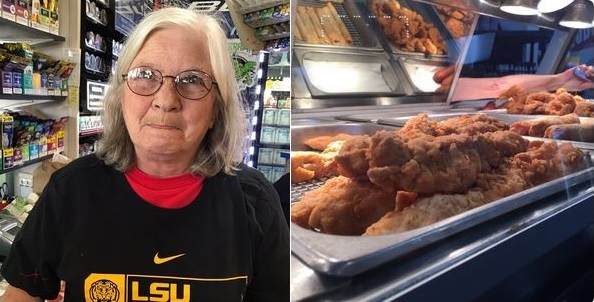 I was going to try to write a blog about LSU-Auburn and update my Rivalry Series blogs, but I was too tired and it’s already getting late, so I’m just going to put up my top 25 and explanation for now. I thought about just copying the top 25 exactly as my formula spits out, but I think that’s unfair to the undefeated teams at this point. So what I did was make the top 5 all undefeated teams and keep them in the order my formula has them, and then make the other 20 teams the best remaining teams in the order my formula has them. So there are no team-by-team personal judgments here. Since 2011, I believe, I’ve waited until after the games of the first week of November before I strictly follow the formula in my blog top 25. The top 25 here is essentially how I would vote if I were a voter in the AP or coaches’ poll, so while I generally have switched to following the formula, there are still some exceptions to account for continuity (such as a reluctance to remove a team from the #1 spot with no defect in their play) and scheduling quirks (such as a team who just had a bye week is about to play a very high-quality opponent and I’d rather that game decide whether they go down in the rankings if they lose instead of the bye week deciding). 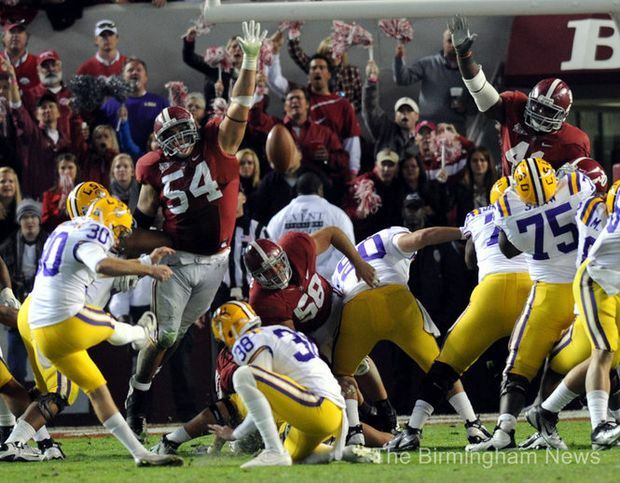 The LSU-Alabama game hasn’t been as competitive as it once was (although there have been close games, the same team has come out on top the last several meetings), but it gives Alabama a chance to recover from the bye week, which has consistently been before the LSU game (and Alabama has consistently been one of the top teams). This year Clemson plays North Carolina St. that week, and Georgia plays South Carolina. One may not have expected it earlier in the year, but both North Carolina St. and South Carolina are serious competitors at this point for their respective divisions. Despite the last couple of weeks, 2011 seems like a very long time ago for LSU fans. I prefer not to switch teams at the top back and forth, and what tends to happen is among the top few undefeated teams one or two of them will have losses against the better opponents rather than it simply being a contest of who played the best team last week. Even if the teams remain undefeated, I’d rather make a change after November 4 when we have more chance of stability (since each week is a smaller percentage of the season) than possibly change back and forth between now and then. Out of rankings: (15)	Houston, (21)	Florida, (22)	Kentucky, (23)	Oregon, (25)	Okla St.